Toronto, Ontario, February 6, 2019 - Metro Toronto & GTA Realtors® reported an overall total of 4,009 sales of Homes through the MLS® System of the Toronto Real Estate Board in January. That was a very slight increase of last January’s 3,987 print...but an increase nonetheless. The Board’s monthly MarketWatch publication - released this morning - also made note of the less-than-favourable weather in the latter stages of the month and the negative effect it may have had - particularly on the buyer side. 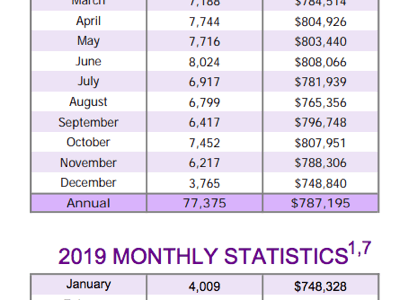 Overall - meaning all home types and all TREB areas - the average sale price also eked out a gain over last January, adding 1.7% to $748,328. While total sales volume bettered December’s by 6% [3,781/4,009], January’s average price didn’t - albeit off ever-so-slightly from December...probably not significant, but a modest increase should probably have followed the relatively healthy increase in sales volume. The January numbers were bolstered in large part - again - by home sales at the more moderate price points...particularly Condo Apartments. Hardest hit were Toronto Detached homes, down nearly nine percent - or just over one hundred thousand dollars - YoY [though up about two-and-a-half percent - or $28,000 - from December's $1,145,892]. All figures herein are year-over-year [YoY] comparisons, unless otherwise noted. Turning to the specific home types & styles, sales of Detached homes within Metropolitan Toronto - “The 416” - were down 8.6% to 342 units at an average selling price of $1,174,134, down 8.8% as noted above. In “The 905” area code - the balance of the Greater Toronto Area, generally, sales in the Detached segment were up 7% to 1,361 at an average of $883,027, up nine tenths of a percent. Sales of Semi-Detached homes [“Semis”] were down 3.2% in the former and down 6.1% in the latter with average sale prices up 6.1% in the former to $993,465 and up 1.8% in the latter to $650,737. TownHome [Freehold, as opposed to Condominium] sales increased 4.4% in the former and 2.1% in the latter to averages of $797,528 [+12.3%] and $600,465 [+2.1%] respectively. Condo Apartments showed continued strength: Though the number of sales was down 6.3% in Toronto to 840 units on the month, that drop is most likely attributable to low supply rather than demand. That’s backed up by their average sale price increase of 8.8% to $591,444. In the rest of the GTA 398 units sold, up 6.7%, averaging $456,857, up 8.2%. If you’re interested in what’s going on in the Bungalow market in and around Toronto and the GTA, see this post doing a deeper dive into those figures including a map which gives a “snapshot” of average Bungalow prices all over the Greater Golden Horseshoe. The all-important Total Active Listings figure came in at a relatively stable +.6% to 11,962 homes on the market. “New” listings were “+10.5%” to 9,456. “New” being in quotation marks because “new” isn’t always what it appears: “New” often includes properties that were already on the market and subsequently re-listed to change the price or simply “freshen up” the listing, etc. Forward Inventory [Total Active Listings / Sales] stood at nicely balanced 2.98 months - virtually unchanged from one year earlier [2.96]. The Absorption Rate - the rate at which the market’s “absorbing” newly listed properties [Sales / New Listings] was 0.42 - also little changed YoY [0.47]. “It is encouraging to see the slight increase in January transactions on a year-over-year basis, even with the inclement weather experienced in the GTA region during the last week of the month. The fact that the number of transactions edged upwards is in line with TREB’s forecast for higher sales in calendar year 2019.” - TREB President, Garry Bhaura. “Market conditions in January, as represented by the relationship between sales and listings, continued to support moderate year-over-year price increases, regardless of the price measure considered. Given housing affordability concerns in the GTA, especially as it relates to mortgage qualification standards, we have seen tighter market conditions and stronger price growth associated with higher density low-rise home types and condominium apartments, which have lower average selling prices compared to single detached homes.” - TREB’s Director of Market Analysis & Service Channels, Jason Mercer. Homes sold “3.1% slower” this January versus last at 33 Days on Market [DOM] compared to 32. Drop a line anytime if you’d like an update of market activity in your neighbourhood - or any other neighbourhood that’s of interest to you. We can include sold prices if you’d like to receive them.